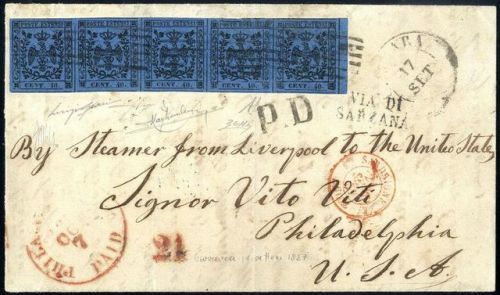 Cover, old Letter, Prussia, 1866, 10sgr rose. In combination with North German Confederation 1868, 2gr ultra + 5gr bister on reverse of cover to Berlin, all tied by “New-Ruppin, 21 6, 68” cds’s, Very Fine, a scarce combination. Michel No. 20. Scott No. 21; Estimate $200 – 300.
old letter cover from 1919 (16 Oct). Tomaspol to Vinica.Fkd money order on both sides with mixed issues / ovptd. Violet cachet lovely complete otem and rarity. Ex – Gribrick coll. 25Rp. Mixed postage Rayon I + II. 5Rp. On cover from Moutier to Berne. 16II types 8 + 16 / B1-LU have slight error in cutting, very fine. 17II type 2 / B3-RO is white margined and perfect. Decorative cover, certificate with photograph Weid.